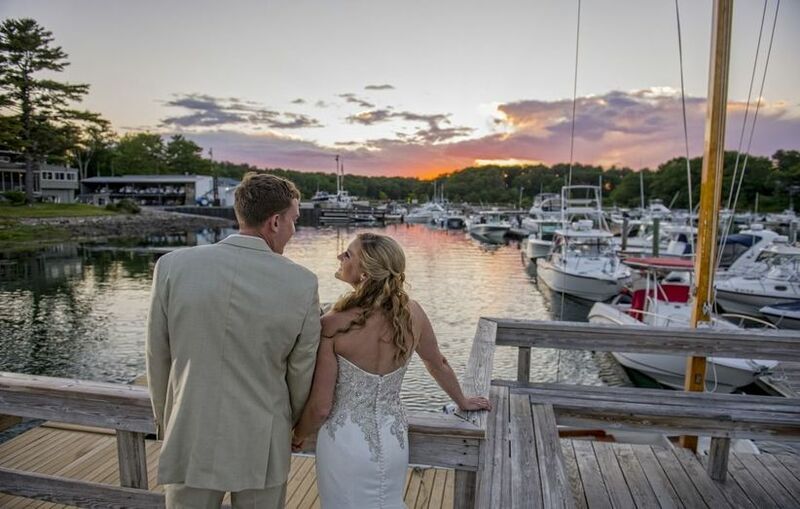 If you've always dreamed of exchanging vows with the water as your backdrop, check out these waterfront wedding venues in Maine. 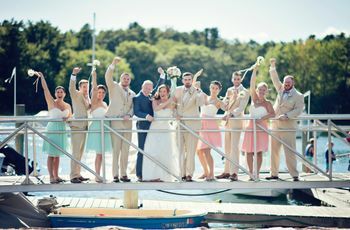 One of the benefits of hosting a wedding in the Pine Tree State is the abundance of waterfront wedding venues in Maine. Because the state borders on the Atlantic Ocean and features numerous lakes, rivers, and other bodies of water, there’s ample opportunity to host a nautical event with incredible waterfront views. From luxurious hotels to historic inns, woodsy cabins and more, you’re sure to find a Maine wedding venue on the water that suits your style. 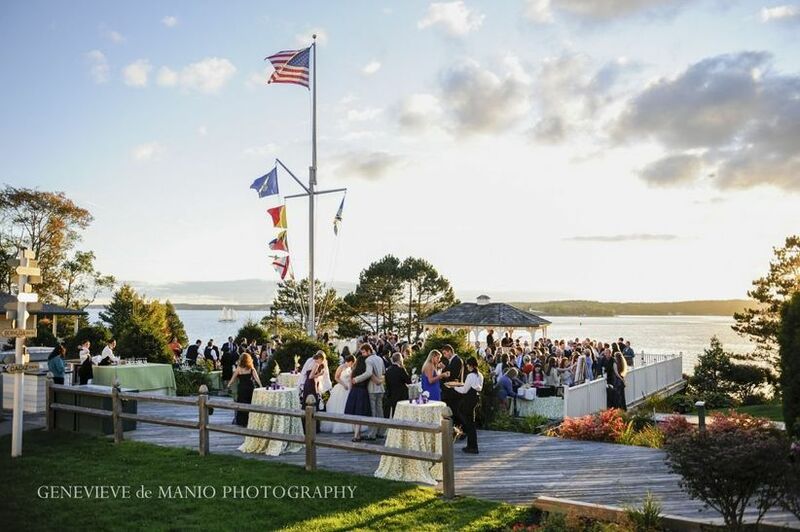 Take a peek at some of our favorite waterfront wedding venues in Maine. Located in York Beach, this coastal Maine wedding venue is the perfect spot for a New England destination wedding. Host your ceremony on the oceanfront lawn, followed by cocktail hour on the patio and dinner and dancing in the Grand Ballroom, which can host events of up to 200 guests. For smaller weddings, the Breakwater Room can accommodate up to 80 guests. This is an all-inclusive venue, with a variety of wedding packages to choose from. And with over 70 guest rooms, your friends and family members can stay on premises for a fun, action-packed wedding weekend. 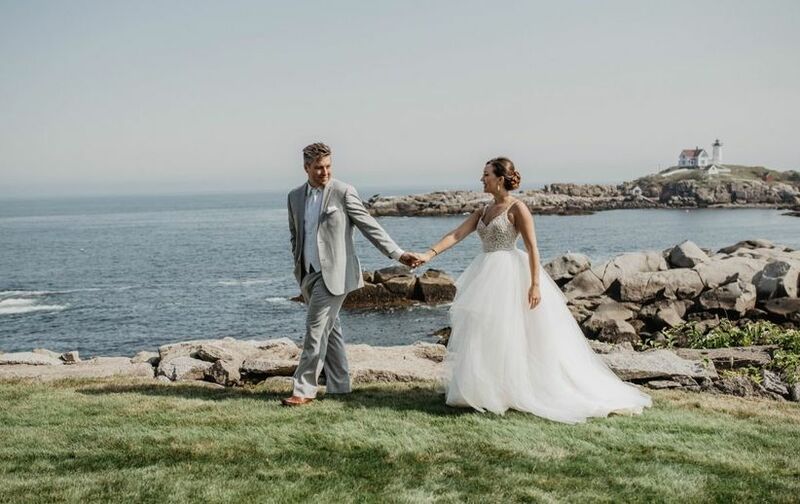 This aptly-named waterfront wedding venue in Maine features truly breathtaking Atlantic Ocean views from its rocky cliffs. The resort offers event space for up to 250 guests, including several outdoor ceremony spaces, from an ocean view patio to a garden. 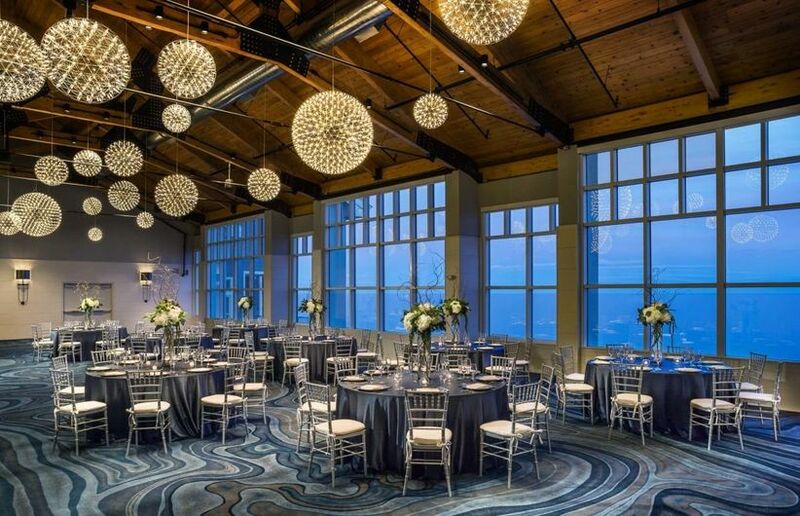 The Atlantic Ballroom is pure nautical-chic, with gorgeous panoramic views of the water, a vaulted cedar plank ceiling, and more. There’s also the Cape Neddick Salon for smaller events. If you’re hosting a destination wedding in Maine, your guests will love staying the weekend (or longer!) at the Cliff House, with its ample activities and amenities. 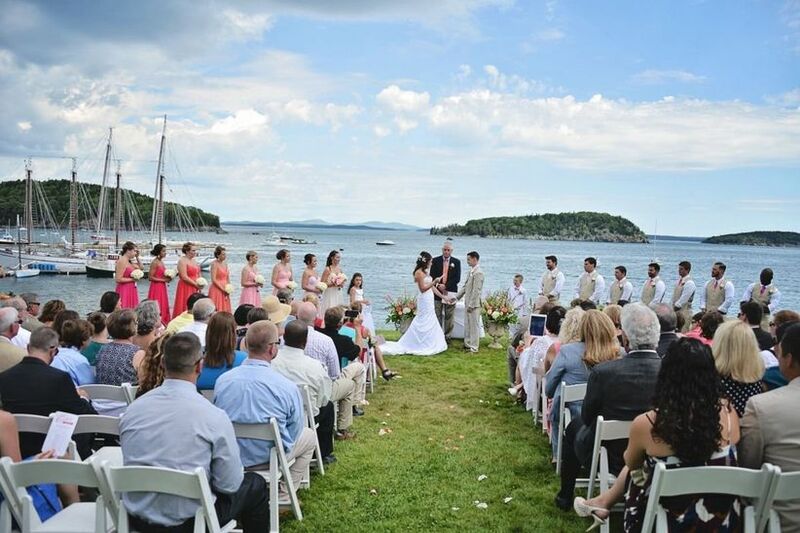 Whether you’re dreaming of a laid-back beachy wedding or a more luxurious, black-tie affair, this waterfront wedding venue in Maine is ideal. 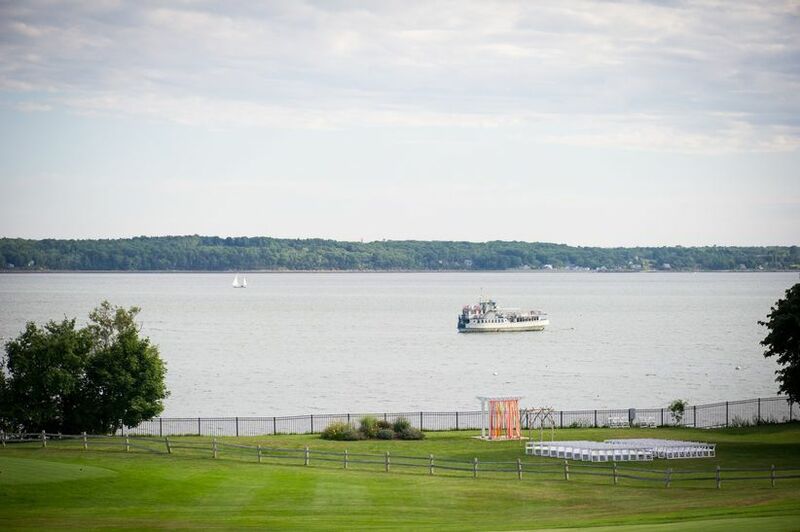 Set on 230 acres on Penobscot Bay, The Samoset Resort can host your entire wedding weekend, from rehearsal dinner through the post-wedding brunch. 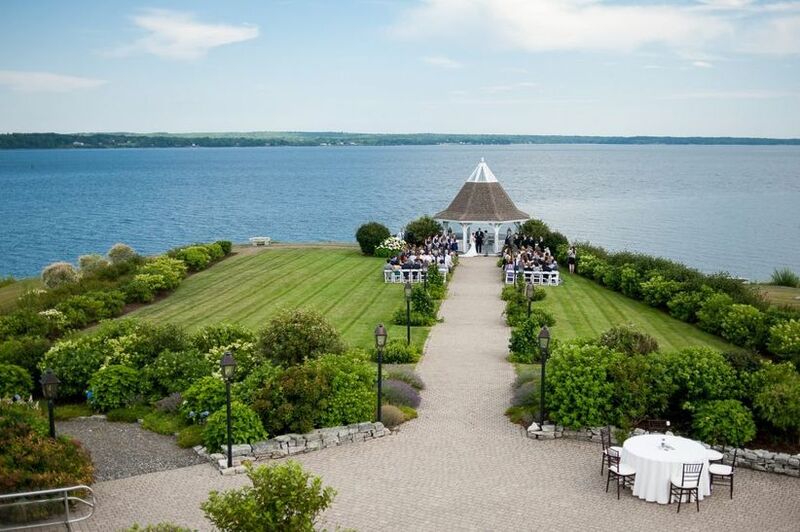 You can host a tented reception and ceremony in the elegant Penobscot Bay Pavilion, located in the resort's gardens and with a capacity of 300 guests. For a more formal wedding, the Bay Point Ballroom can accommodate up 125 people, while the opulent Knox County Ballroom is one of the largest ballrooms in Maine, with the ability to host up to 300 guests. There are a variety of wedding packages to choose from, from buffet-style meals to seated dinners. 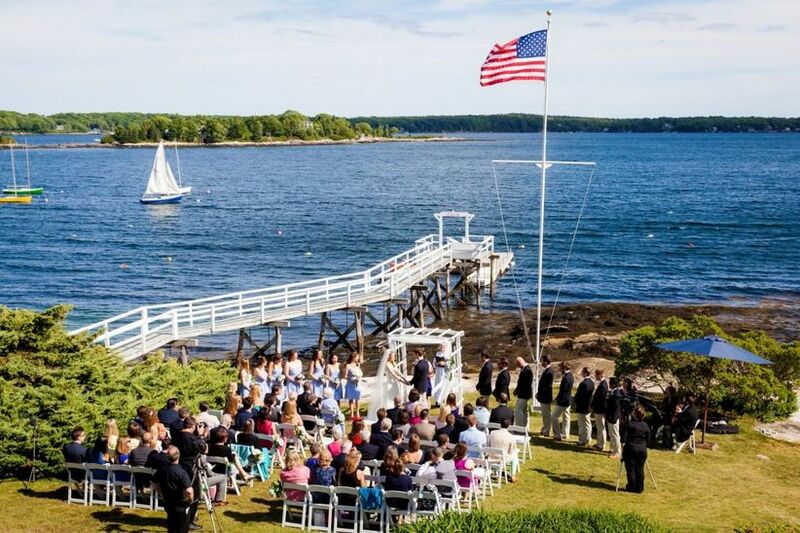 This classic Boothbay Harbor, Maine wedding venue on the water is located about an hour away from Portland, and features 10,000 square feet of indoor and outdoor event space. 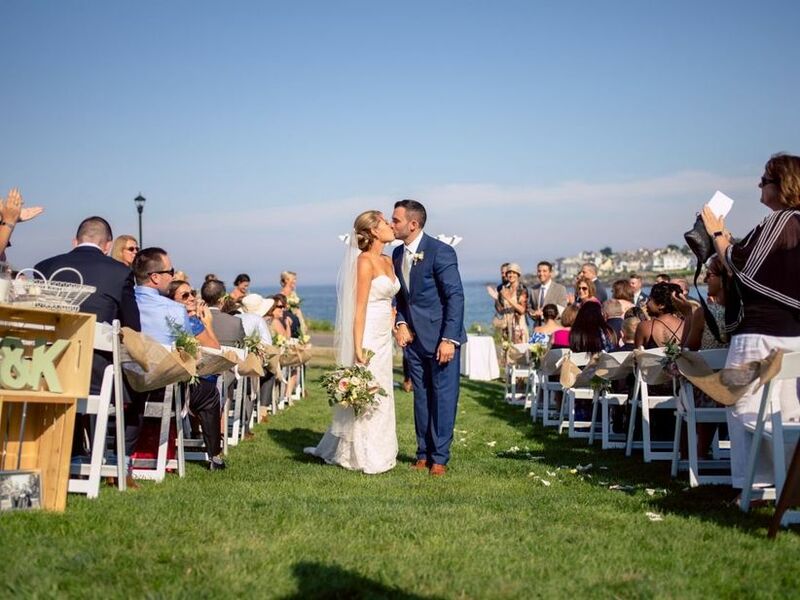 Wedding ceremonies and cocktail hours are held on the Oceanfront Deck featuring Atlantic Ocean views, and receptions inside the Pemaquid, a unique and rustic setting with vaulted ceilings made from natural pine and cast iron chandeliers. There’s space for up to 250 guests, and this is another ideal venue for destination weddings—your guests will love exploring the local area. Whether an outdoor, indoor, or tented wedding is your preference, this coastal Maine wedding venue truly has it all. Host your ceremony on the Stone Patio with its bay views, or in the unique Turtlehead Room with its beamed ceiling. Receptions can be held in the classic Steelhead Room, the nautical-inspired Bayview Room, or enjoy a tented reception on the Grand Lawn. The Wentworth Event Center can accommodate up to 300 guests, and offers in-house catering, with the option to bring in your own caterer if preferred. This waterfront wedding venue in Maine also has its own private rocky beach—ideal for some truly stunning photo ops. Ever dreamed of getting married on your own private island? At this Portland, Maine wedding venue, it’s entirely possible. 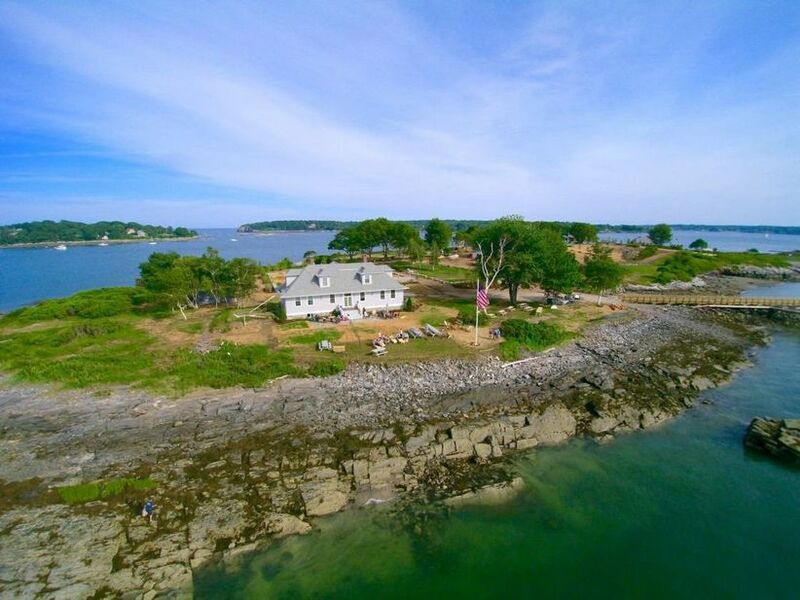 You and your guests will boat across Casco Bay to reach this island, where you can host an outdoor ceremony overlooking the water and tented reception for up to 1,000 guests. There are also several indoor spaces in the historic houses on the island. This venue can arrange all of your vendors and services (even late-night fireworks!) to make planning a breeze. 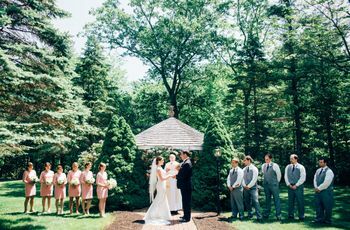 If you’re looking for a relaxed waterfront wedding venue in Maine, this Boothbay Harbor resort offers a unique, camp-like setting (some couples liken it to the rustic resort setting of Dirty Dancing). Whether you’re dreaming of an elopement or a destination wedding for up to 150 guests, this resort has a casual setting with the option of renting out the entire space for the weekend. Ceremonies are held on the oceanfront lawn, and receptions in the indoor reception hall, complete with large stone fireplaces, panoramic windows, and a rustic feel. You can also host your rehearsal dinner and other wedding events here. Couples dreaming of a luxurious waterfront wedding venue in Maine will adore this impeccably-manicured 14-acre private estate in Stockton Springs, which offers a variety or indoor and outdoor settings for ceremonies and receptions. In fact, there are eight spaces for ceremonies alone, from gazebos to oceanfront lawns, cobblestone terraces to indoor conservatories. You can host your reception indoors or under a sailcloth tent. Guests can stay in one of two homes on the property, or in one of the nearby rental cottages. Couples rave about the peaceful, serene setting, and accommodating staff. Host your intimate ceremony and reception at this York, Maine wedding venue, which can accommodate up to 160 guests. The front lawn is an ideal space for ceremonies and cocktail hours, with its views of the Atlantic Ocean. You’ll also love the recently-renovated fine dining restaurant for your reception. For smaller events (including rehearsal dinners), the Deck Room can host up to 60 guests, and features beautiful harbor views. Your wedding party can also stay the weekend in the B&B. Conveniently located an hour from Boston and minutes from Portsmouth, New Hampshire, this York, Maine inn offers a stunning setting for the perfect wedding. 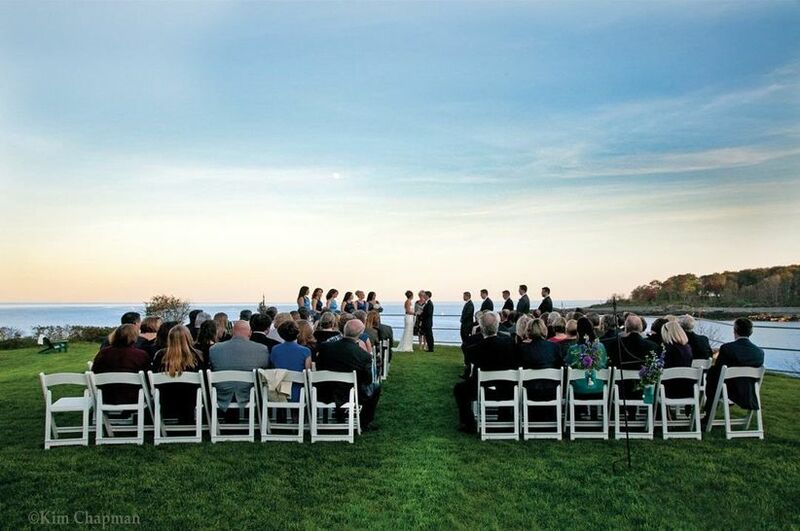 There’s space for up to 150 guests, and the ceremony site on the Point with the Atlantic Ocean as your backdrop is absolutely jaw-dropping. The Harborview Room is ideal for receptions, with its beach views. You’ll also love that this is an all-inclusive venue with guest rooms on site for your loved ones. The Stage Neck Inn is also a popular spot for laid-back rehearsal dinners, from classic New England clambakes to casual barbecues. 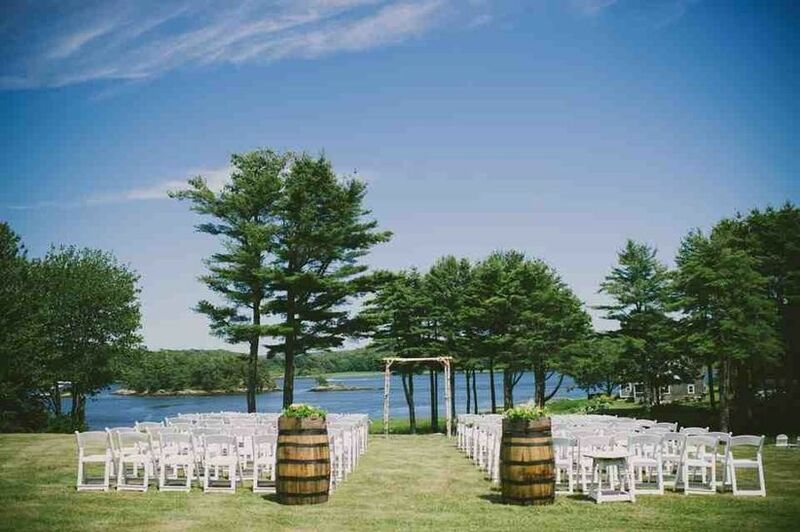 If you’re looking for a Maine wedding venue that combines rustic, woodsy charm with a waterfront setting, this may be the ideal spot for your big day. 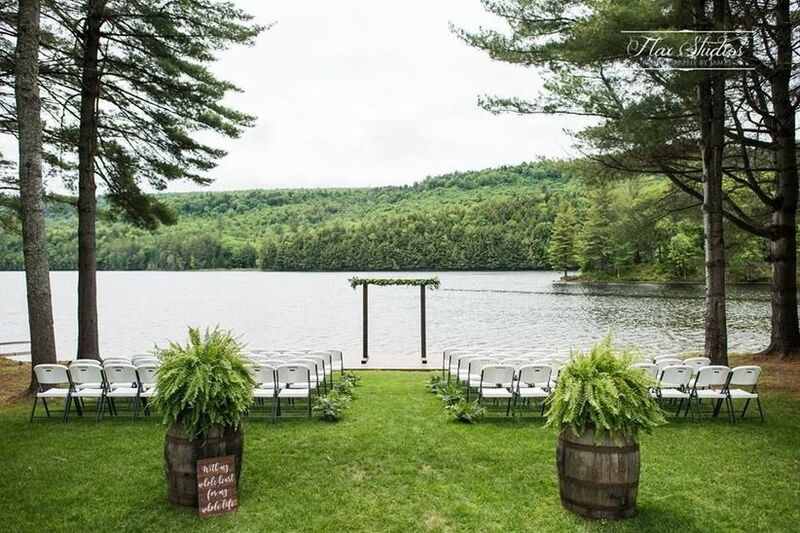 Located on Wyman Lake in Caratunk, the Maine Lakeside Cabins & Event Center has a variety of customizable wedding packages to make your planning experience stress-free and fun! 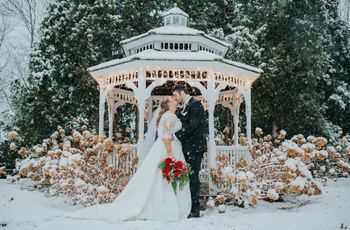 Host your ceremony on the waterfront lawn surrounded by trees and overlooking the lake or inside the barn, and your reception inside the Lodge, which has space for up to 112 guests. Your crew will also love gathering around the fire pit as your wedding day draws to a close. 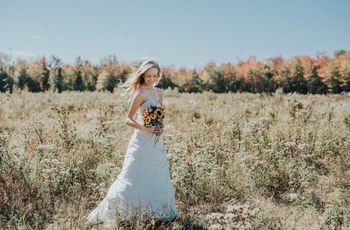 You and your friends and family members can also stay on-site in the cabins, giving your destination wedding weekend a relaxed, camp-like feel. There’s nothing quite like an intimate waterfront wedding set at this historic inn on the MidCoast of Maine. Set on four-and-a-half acres, you’ll have your pick of unique spaces to host your wedding day, from the hilltop lawn overlooking the Kennebec River to the rustic 19th-century barn to the luxe mansion. The inn can accommodate up to 116 guests for weddings, and 16 guests can stay at the B&B on premises, complete with farm-to-table breakfast and nearby activities. The 1774 Inn garners raves for its caring staff and breathtaking setting. 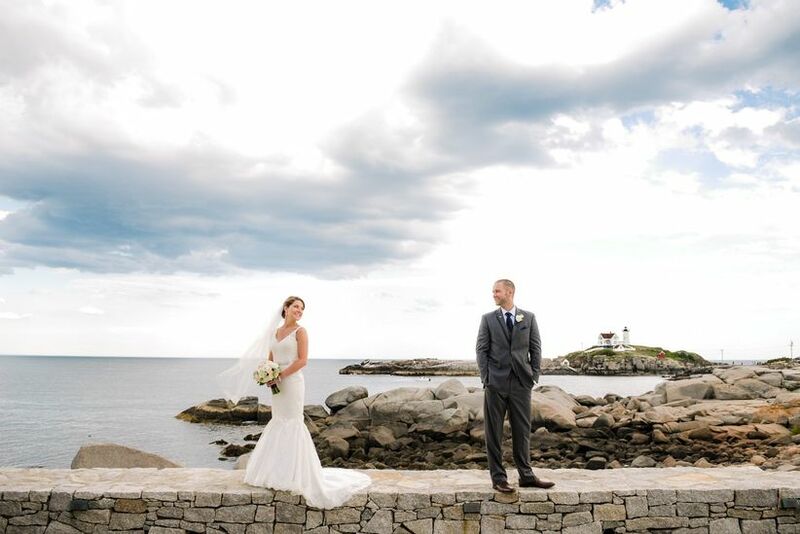 For the ultimate nautical wedding, choose this waterfront wedding venue in Maine, with its stunning views of the Atlantic Ocean and the Cape Neddick Lighthouse. Process down the grand granite staircase to the ceremony lawn, complete with those panoramic ocean and lighthouse views. Wedding receptions are held under a sailcloth tent, with space for up to 175 guests. For the full destination wedding experience, you can rent out the entire hotel so your whole crew can stay onsite. You’ll love this Maine wedding venue on the water, with its serene setting on Frenchman Bay and views of the Porcupine Islands. The Bayview Lawn is the ideal spot for a ceremony, as its surrounded by flower gardens and water views—plus a four-masted schooner sailing by provides an incredible photo op. Enjoy dinner and dancing inside the Reading Room or the Porcupine Room, both with large windows and ample natural light. 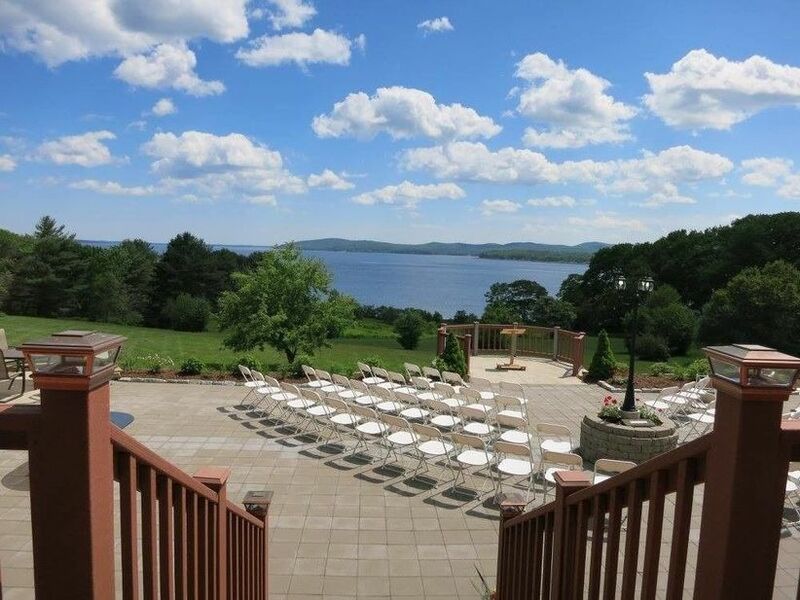 The Bar Harbor Inn can accommodate up to 150 guests for weddings and events.